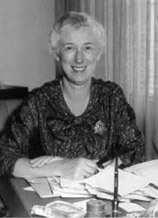 The late Ellen Fairclough’s contributions to public life are widely known: her groundbreaking leadership as Canada’s only female Member of Parliament in 1950 and her status as the country’s first female federal cabinet minister in 1957. But Dr. Joan Heels, a vocal and piano teacher, remembers her as “Aunt Ellen”, a caring and thoughtful woman who both contributed to and carried on her family’s strong tradition of musicianship. Ellen Fairclough, nee Cook, grew up playing piano, and shared her talent by playing the organ at local churches. She even had a live show on CHML Radio with her younger sister, Mary, Joan’s mother, who sang to Ellen’s accompaniment on piano. Joan says her mother told her that they earned about $5 per show and promptly spent some of it on sheet music for their next performance. Howard, whose health had been weakened by a bout with polio in his teens, died in 1986. Afterwards, Ellen and Gordon met with Hamilton Community Foundation to talk about how they could both honour Howard’s memory and assist budding musicians in Hamilton. Ellen was no stranger to Hamilton Community Foundation, having served as a board member and chair of the board in the 1970s. She appreciated the opportunity the Foundation provided for Hamiltonians to leave a legacy and contribute to a permanent endowment fund for the city’s benefit. The Howard Fairclough Organ Scholarship Fund at Hamilton Community Foundation was created by Ellen and Gordon Fairclough to benefit young people with talent and the potential to become professional-level organists. When Ellen passed away in late 2004 at the age of 99, a share of the residue of her estate was added to the fund.